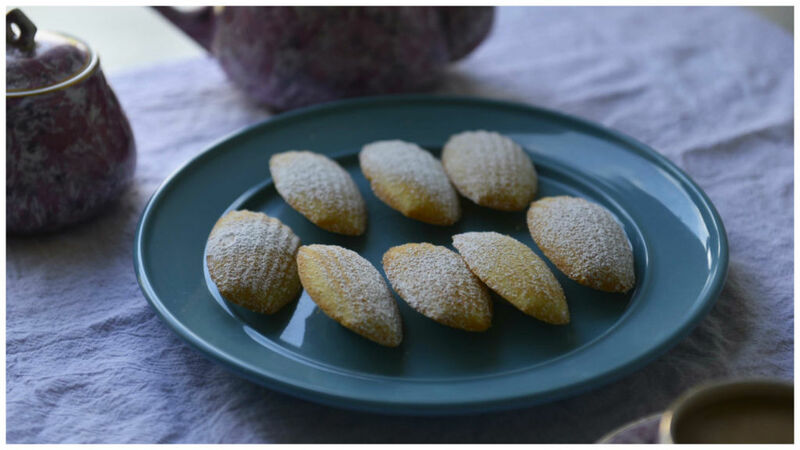 Madeleines – these delectable offspring of cookie and cake seem daunting to make. To top it most classic recipe call for browning butter and thorough whisking off eggs, rest times and careful mixing of flour and eggs. Why bother with all these when you can get these in the store. 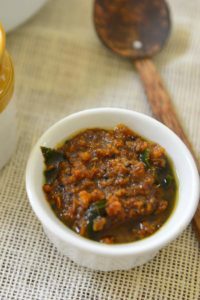 Brown butter does add a unique taste. And the classic recipe and techniques have their value. 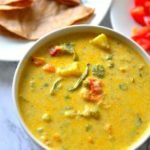 But if you are like me, someone who gets called away from the kitchen ever so often, here is a way simpler recipe … and it tastes heavenly right out of the oven. 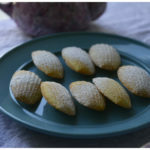 Technically madeleines are bite sized sponge cakes. 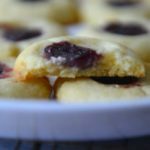 These are made in the madeleine molds and acquires a cookie like bite. Call them a cookie if you like ‘coz these are perfect with a cup of hot tea. 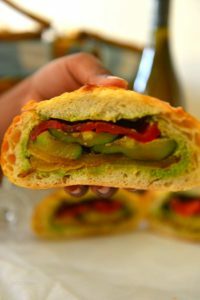 The recipe here has a little baking powder, which can very well be avoided. I add it as an insurance to compensate for loss of aeration when mixing in the flour. Don’t worry, as long as the eggs are fluffed up well, there is very little chance of messing up this recipe. Let me explain these in a little detail. (1)Melt the butter over low heat or in a microwave . Set aside to cool a bit. It should be cool , but not solidified. If you plan to brown the butter it, do not use microwave and melt the butter on stove top over low heat until it is melted and light brown solids start to appear. 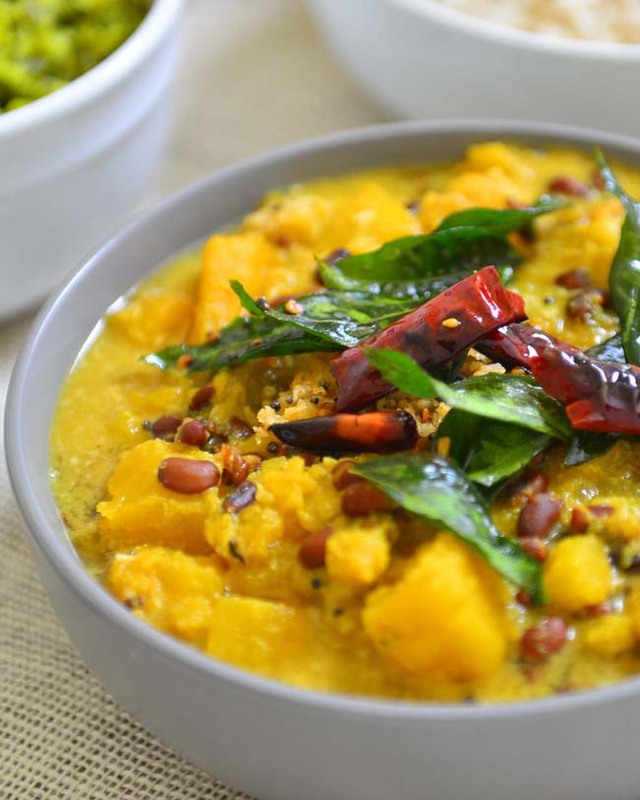 (2)Sift the dry ingredients together and set aside. If the sugar is not fine powder it in a blender. Pre-heat the oven to 375°F (190°C). If using metal madeleine molds butter it well, so that all the nooks and crannies are properly greased. (3, 4, 5) Beat the eggs well till they have doubled in volume. Do this by hand , if you must, but I recommend the mixer. Indeed this is a good workout for the arms 🙂 . Add the vanilla essence and mix well . (6, 7)Slowly add the sugar and beat well to incorporate , taking care to keep the mix aerated well. (8, 9)Add the sifted dry ingredients to the egg mix in batches . Mix in the flour using circular motions (low paddle setting in the stand mixer). Stop mixing as soon as all the flour is blended in. (10, 11) Slowly stream in the melted butter and mix using a spatula . You will see the melted butter pooling on top of the batter initially , but after a few turns with the spatula the butter mixes in and the batter changes visibly and acquires a silky sheen . Stop mixing as soon as all traces melted butter is gone . (12) Transfer to the waiting molds , about 3/4 way full. Bake for 8 to 10 minutes if using a metal pan , or 10 to 12 minutes in a silicone pan. Remove as soon as they turn brown on the sides . Using Silicone Pans – Silicone pans are very convenient when making madeleine as they don’t require any extra greasing. But placing these directly on the oven rack often times tends to tilt the molds and skews the shape. In order to prevent this place the silicone mold on a baking sheet and transfer to the oven. 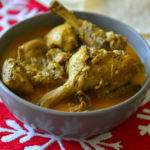 Remove it from the sheet and place directly on the rack at around 8 to 10 minutes and finish cooking to the desired brownness . Leaving the cookie sheets for total duration of cooking browns the bottoms unevenly. The metal pans on the other hand, create a very even browned look and shaves a few minutes off the cook time as well . 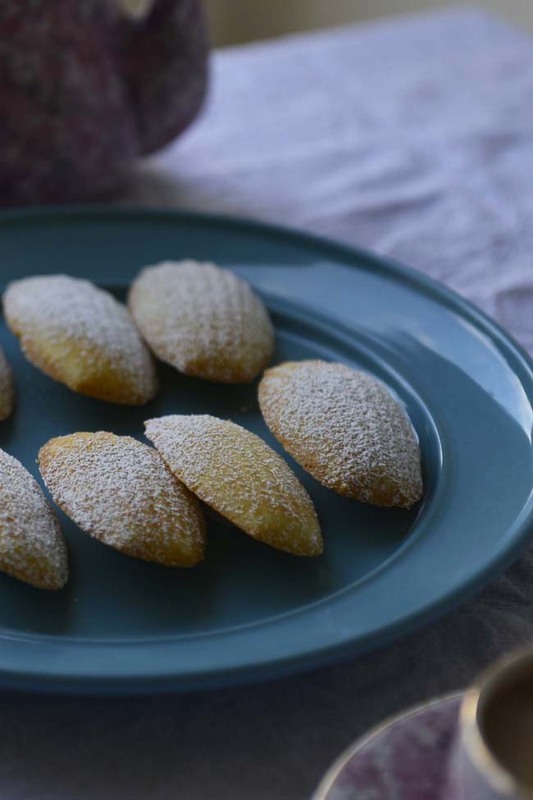 Classic French Madeleine in a simpler recipe. 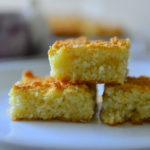 These little cake bites can be made easily by paying a little attention while making the batter. Beat the eggs well and slow down to mix everything in just enough. Sit back , relax and enjoy these warm with a cup to tea ! Prepare the molds by generously buttering the insides. Pre heat the oven to 375°F (190°F). Sift the dry ingredients - flour , baking powder and salt- together. Set aside. Beat the eggs well for 5 minutes. It should have doubled in volume and aerated well. Add the vanilla essence and mix . To this add the fine sugar slowly and beat in. Add the flour mix in batches and mix in using a spatula without forming a lumps. Slowly stream in the melted butter and mix using circular motions. The batter changes visibly . 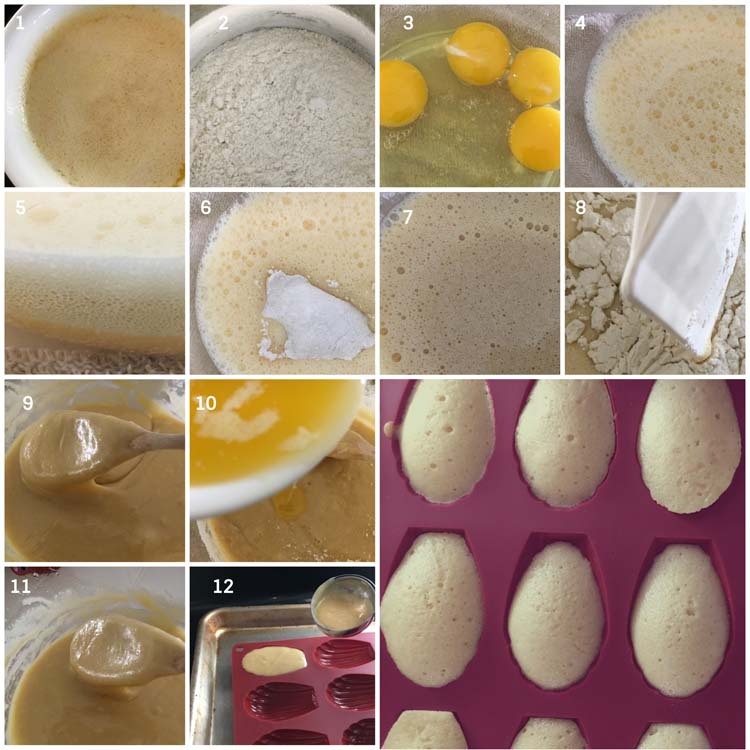 Pour into prepared madeleine molds, filling each mold about 3/4 way full . The cook time mentioned is for golden crust on metal pans. If using silicone molds, increase the cook time by 2 to 3 minutes. 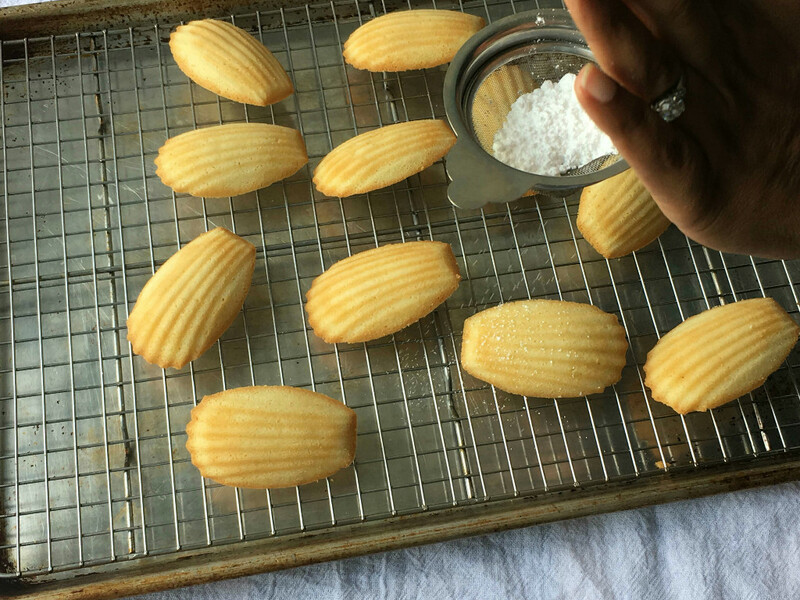 The madeleines are done when the edges begin to turn golden brown. For more browned look in crease the cook time by 2 minutes.